Hot Dip Galvanized like the tower section itself. Lasts Longer than the zinc plated versions. Perfect replacement bolt kit for high corrosion environments. Rohn equivalent Grade 5 bolts and nuts. Note: The Old Bolt Kits you got inside the leg of each ROHN 25G Tower Main Section were zinc plated. These are Hot Dip Galvanized High Strength Grade 5 Steel for Longer Life! 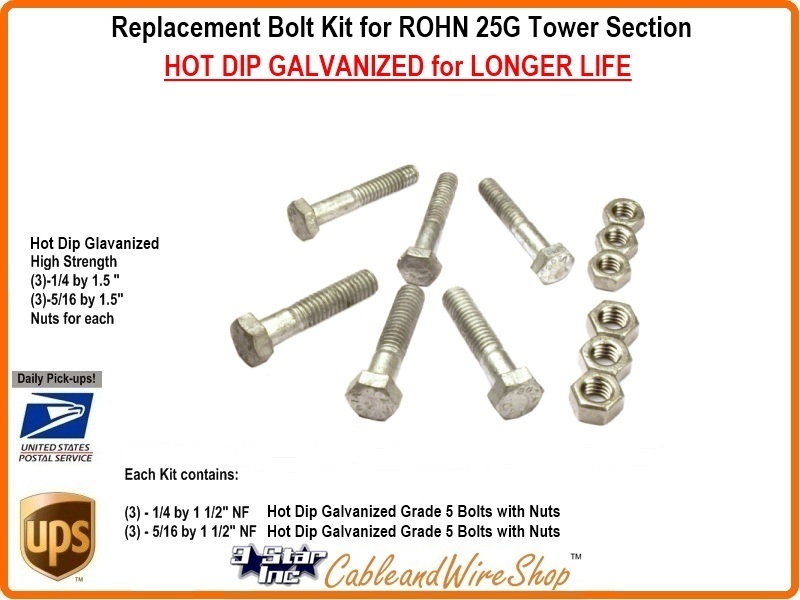 This is the Exact Bolt Kit you get inside the leg of each ROHN 25G Tower Main Section. Factory OEM Product to the exacting specifications and Bolt Grades to assure Safety, Longevity and Reliability.